Tupelo Honey: Am I crazy? I must be Insane. I've been a slack blogger. But it's because I've been busy doing other things. 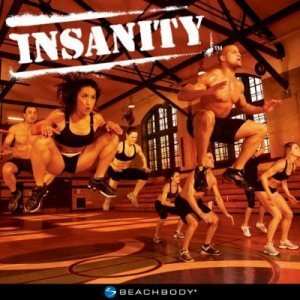 After a little over two weeks of doing this workout, I completely understand why it is called Insanity. In fact, I understood this after day 1. No other name would describe this workout. It is madness, but I LOOOOVE it. That is, I love it when it's over. Day 1 is a Fit Test. You do a series of exercises for 1 minute and record how many reps you were able to do. Here were our results. Mine are on the left, Andy's on the right. The Fit Test was hard. But nothing compared to what was to come. Day 2 was the Plyometric Cardio Circuit. Holy moly. While I wasn't in the best shape going into this, I'd like to think I've done some pretty demanding workouts in my life. I mean, my volleyball and basketball coach in high school had us doing circuits with SANDBAGS draped on our shoulders everyday, for goodness sake! This workout brought me back to those days, but times 100. I have NEVER sweated so much in my life, nor have I experienced the sensation of my muscles giving out long before my mind does. Literally, even if I wanted to do one more rep of "globe jumps", it wasn't gonna happen. And now I'm on day 17, and I still have had this "muscle-giving-out" feeling with each workout. I'm waiting for it to stop, and for me to be able to at least make it through the warm-up (which is almost as hard if not harder than the workout itself) without having to stop because my muscles are on fire and my knees are buckling. I don't see that happening anytime soon. With all of that being said, I love the pain. Is that weird? It's the first workout since playing organized sports that I walk away from and actually feel like I've pushed myself to my limit. My favorite of the workouts for month 1: Cardio Recovery, duh. It's still difficult enough to feel the burn, but is more along the lines of yoga. Relaxing and stretches those very sore muscles. Least Favorite: Pure Cardio + Cardio Abs. You don't get any of the 30 second water breaks in this one like you do in the circuits. Then, throw in the Cardio Abs right after, and you're jello. So you see, I've been busy. I come home after keeping third graders interested and occupied during the last weeks of school, play with Birdie a little, prep dinner, become INSANE for 45 minutes, take Birdie on a cool-down walk, finish dinner, shower, bed. Repeat. Even when I've sat at the computer to start a post, I am too exhausted to finish it! I promise to do better! I even have some new recipes to share with you, and I will try to post them soon. Andy just got home from work so we're off to get INSANE!